Fly in style with Pan AMCHAM at Conrad Bangkok, and enjoy the comforts of travel in a bygone era. First class cocktails and dining await as you dance the night away to the upbeat rhythms of Boss Band. The evening also features our Silent Auction, with hundreds of fabulous prizes including luxury getaways, international flights, fine jewelry, and art. 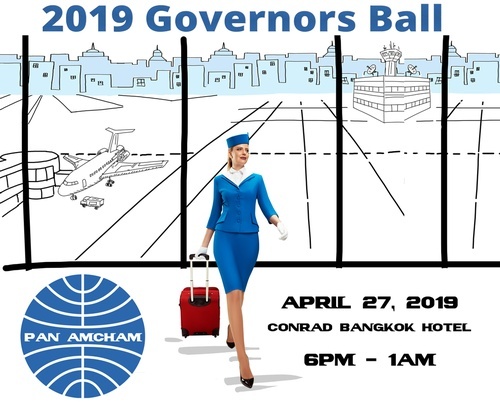 All auction and ball proceeds go to support the American Chamber of Commerce in Thailand Foundation (ATF), whose scholarship program in 2018 supported tuition for 175 high-achieving Thai university students from disadvantaged backgrounds. Stay overnight at the Conrad Bangkok Hotel. Tables will be assigned in the order in which payments are received, so book and pay for your tickets now! Individuals and couples will be assigned tables.